THE BAR STOOL PREACHERS are streaming their new album ‘Grazie Governo’ with The Hard Times. Grazie Governo will be available digitally on August 3rd and in stores in August 24th. 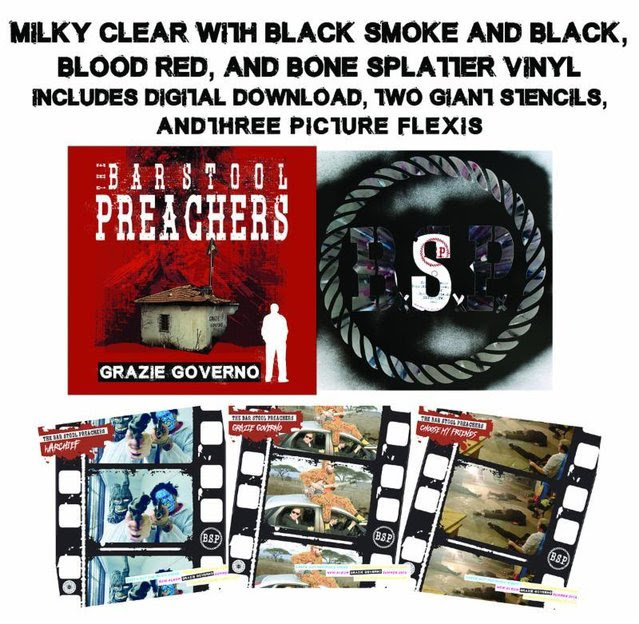 Physical pre-orders are available via Pirates Press Records (http://www.smarturl.it/GrazieGoverno) and The Bar Stool Preachers (http://thebarstoolpreachers.com). With a digital pre-order on iTunes and Bandcamp, fans get 4 tracks instantly! With the upcoming release of Grazie Governo, there are seven different vinyl versions available (the PPR version is pictured below), each including two BIG spraypaint stencils and a digital download. In addition, three picture flexis were made to accompany the music video trilogy. They’re in all colored vinyl copies of the records, and also available at local shops, in mailorder, and at various festivals/gigs. Grazie Governo (“Thank You Government”) is the album that everyone angry and frustrated with the current political situation has been waiting for. The intelligent and passionate lyrics are backed by the unique, catchy, and creative songwriting that this band is becoming known for. It truly exemplifies the band‘s incredible talents and uniqueness, and the energy and commitment that these UK upstarts are turning so many heads with. With the success of their 2016 debut album Blatant Propaganda, this very motivated group of friends got some unreal touring opportunities, and have traveled a LOT of miles sharing their tunes and energy with thousands and thousands of people—and they‘re not letting up anytime soon. They‘ve played big shows to stadiums filled with Germans, and legendary club shows filled to the brim with sweaty punks, rude boys & girls and fans of all ages—and it doesn‘t matter who they are playing with, or who they are playing to, they impress everyone—and have a great time doing it! For the full experience, make the effort to see THE BAR STOOL PREACHERS live and better understand why so many people are hailing them as one of the best new bands around! This album, and their previous full-length speak volumes, but seeing this full package in the flesh truly proves that they are the real deal. CATCH THE BAR STOOL PREACHERS ON TOUR! FEAR ME DECEMBER NEW VIDEO & TOUR DATES REVEALED!